I liked the haphazard look of this slab – Is this what Carrington found when she first came to this site? I got up early today and spent a couple of hours in the breakfast room where I had both light and coffee. I was still working on the Nice portions of the journal and really wanted to catch up on it before I embarked on the Corsica-Sardinia hiking portion. I was mostly successful and still had time afterwards to get packed and ready for the 10:20 am pick-up. We were already in the van when we met up with the rest of our hiking group at the Hotel Pallazu u Domu. On the trip to Filitosa, we got to know our van mates. Judging by the lively conversation, we all have a lot to talk about for the next 10 days. The countryside is beautiful and the road wound upward into the mountains. We went southward to a region called the Sarten or Sartène. 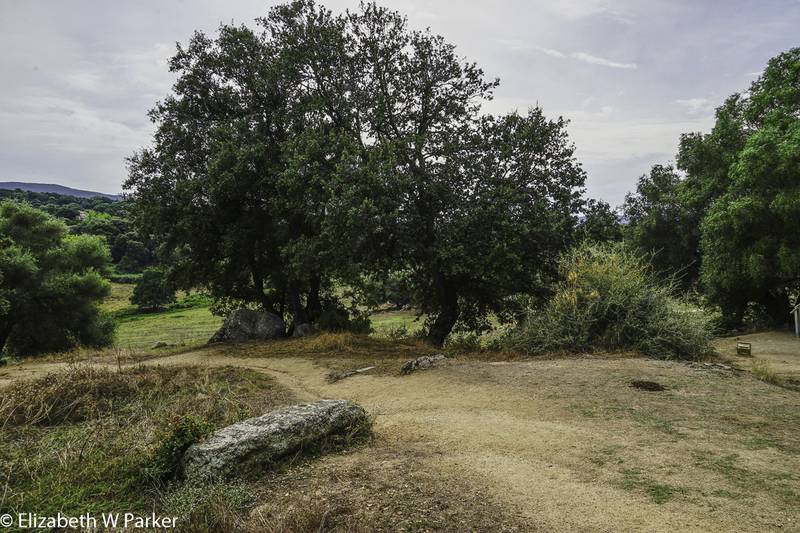 We stopped for a walk at Filitosa, an archeological area of great significance. I read about in in Dorothy Carrington’s book Granite Island. An interesting read, that I highly recommend, Carrington was one of the people responsible for getting scholars and diggers involved in the preservation of Filitosa. Her book was published in 1971, and since then more activity has “developed” the site, but also, to the minds of some, destroyed it. The stones have been moved from where they were found and re-erected in places and ways that do not tell their history. According to Carrington’s research on the stones there are several explanations for their origins, all plausible. I cannot tell you whether post-1971 scholarship has changed that, but I hope to find out. 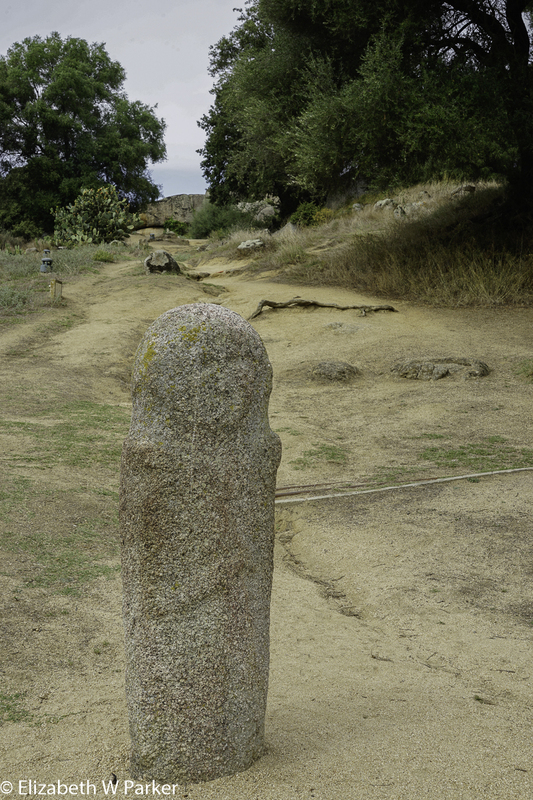 Filitosa is the first site of menhirs we will see on this trip. 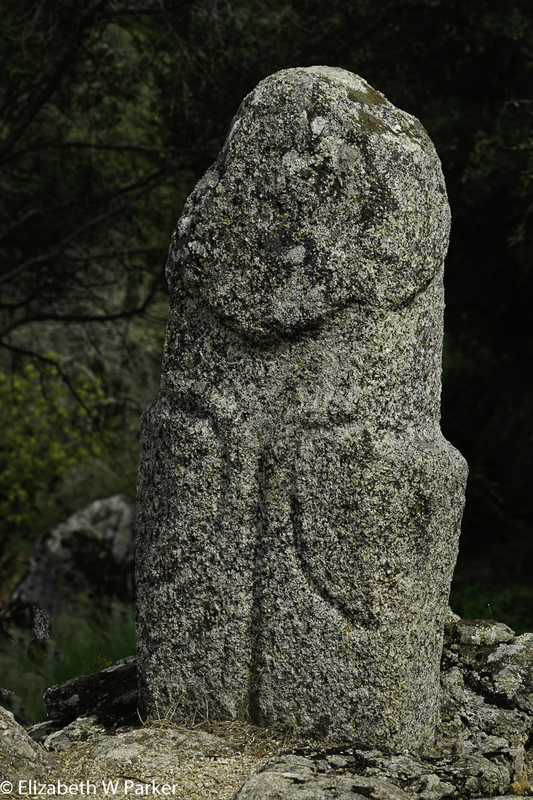 Made by people who lived in this area of Corsica in about 6,000 BCE, menhirs (literally long stones) are large slabs of stone, some carved in bas-relief, others unadorned. Whether they were never adorned or have lost their carving with weathering, I do not know. On some of the most impressive stones the carving is quite clear. What is curious is that the carved stones show metal armaments, something the people of this site would not have seen, acquired or made until the Bronze Age, fully 3 millennia later. 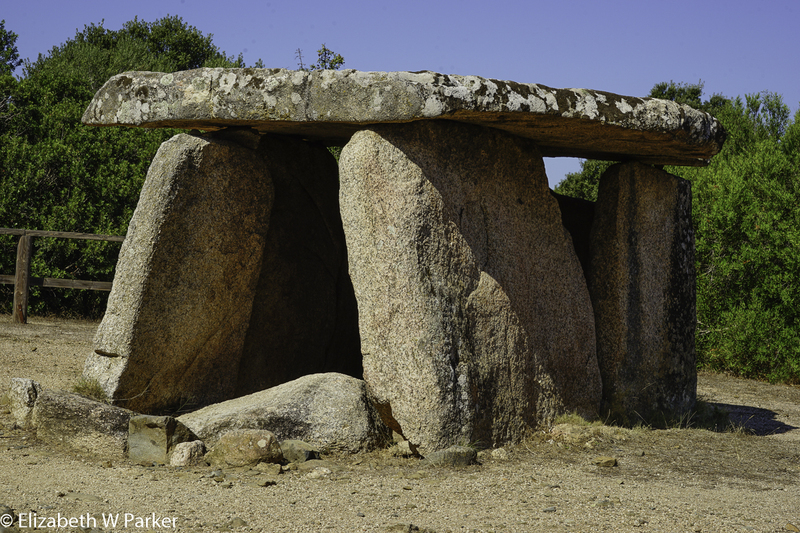 According to Lonely Planet, the stones were erected by the people who conquered the megalithic people. They were subsequently vanquished by Torreens (tower builders). One of the theories that Carrington describes is that the stones may mark communal graves. For these ancient peoples, perhaps being buried en masse helped to protect the living. It is amazing to think that this site got noticed when Carrington heard a casual mention by a neighbor in England of some ancient stones scattered in an uncle’s farm field. This led to a important historical discovery. 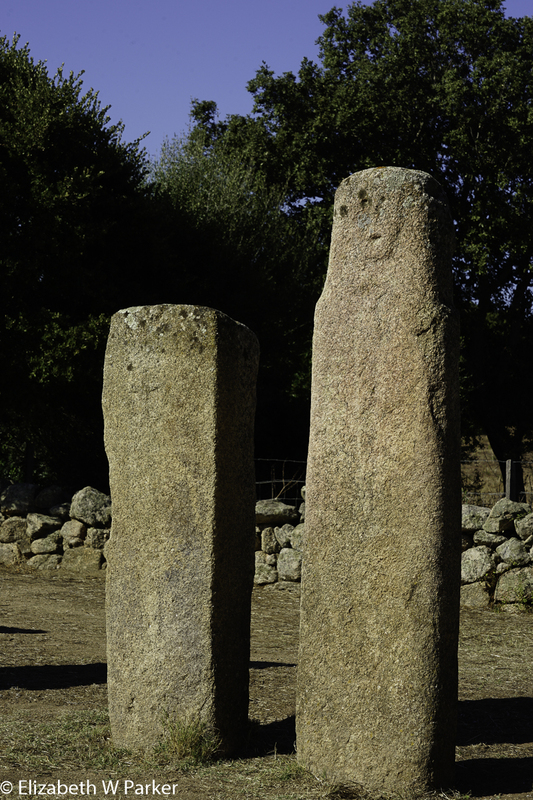 The people who created these stones belong to a rather broadly denominated culture called the megalithic culture. 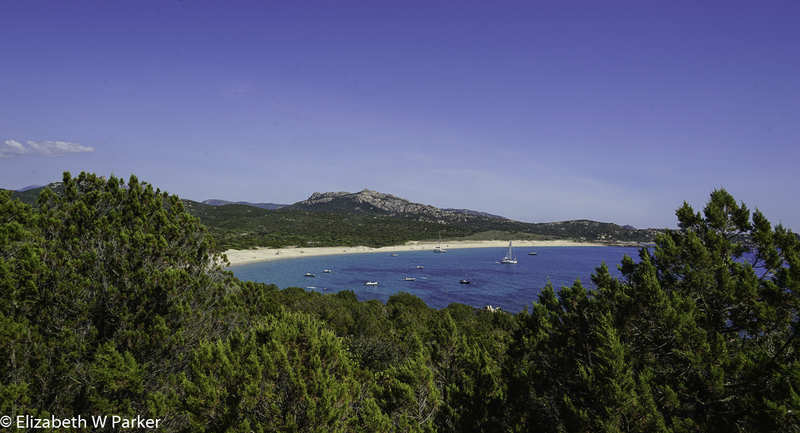 This was not just a culture here in Corsica, but also comprises standing stone cultures throughout the world, and stretching in across millennia. They share a commonality of religious beliefs as evidenced by burial customs and the use of large stones for building monuments and dolmens. Most of the megalithic sites are near coasts, suggesting that the people were traveling the world in boats. Maybe I was expecting too much, but the experience was sort of flat, despite that the first stone we saw had a distinctive face, a long sword and a dagger. I think I need to read more about these stones as the story given by our guide did not sync with the story told by Carrington, leading me to believe that, indeed, a great deal of research has been done, and that theories have changed. I do recommend you visit this site, but you will definitely enjoy it more if you read up on it beforehand. (And I hope you will get to see it with peace and quiet.) There is a visitor’s center of sorts (so you can pay to go in, as the land is still privately owned) and there are little speakers in place near the stones so that you can press a button and hear an explanation in English, as well as French and Italian. The walk will take you up and down, over and around all sorts of stones. You will see what is purported to be the quarry from where the stones were taken, and you will see some of the ruins of the “Torreen” structures – They tore down and broke up the standing stones and used them to build their iconic towers. (Torre – tower). There is also a small museum with artifacts which we had to run through. Our group had refreshments in a little bar at the exit and then loaded up our vans and continued the drive to Sartène. Our hotel in Sartène is a four-star Best Western (Hotel San Damianu). The hotel is very modern and clean and wonderfully situated at the edge of the town, overlooking a long valley, that stretches from higher hills to the east through lovely farm land to the sea to the west. It has a bit of everything you want to see in a view: Church steeples in verdant valleys, wonderful sunsets off to the left and dawn, as it breaks, to the right. 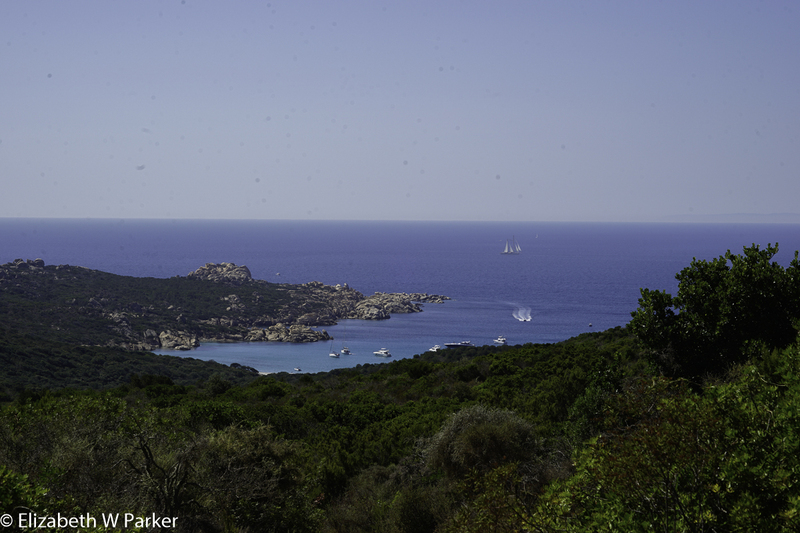 The day began with a hike through the macquis, the Mediterranean scrub that is iconic of Corsica (and called macchia in Sardinia). Farmers’ fields bordered our path. The way is lined with oak trees. Not the large spreading oaks that I know in Wisconsin, but lovely shade trees nonetheless. We finally arrived at the Plateau de Cauria also called I Stantari Here, we saw megalithic stone menhirs standing, in their original positions. Probably because of the remote location of the site these were never destroyed – or tipped over and broken (imagine a cow using it for a scratching post…). I could not tell from the explanation we received if these were buried and excavated, or were just always standing here, through the centuries. Can you imagine it for a minute? Sometimes forgotten for years and years, other times the site of a lovers’ tryst, a shepherd’s lunch, a tent camp for nomads? Who knows? But at least 4-6 millennia separate us from the people who erected them. And, it is entirely possible that a hundred years could have separated the the earliest stone from the next youngest. There is just so much I don’t know – starting with why they are arranged the way they are. We continued to walk through the countryside; our destination is the beach. Our walk was hot but the moment we saw that Silver Beach, new energy was injected into our group. One thing I learned in spades on this trip is that things often look close, just right over there, but there are rather long walks to get to them. Our first view of the beach – still far away. The Silver Beach, or Plage d’Argente, was wonderful. Not large but not a cala either, the beach is a beautiful arc of silver sand right up to the gorgeous sapphire water that surrounds Corsica. The sand must be the product of bleached corral, as all around is the golden sandstone that makes up the yellow sand that is much more common. We took a momentary rest, but continued on to a larger beach, a long wide sweep of beautiful beach, la Plage de Tralicetu and that same sapphire water. We stopped here for a picnic and a swim. That refreshing water was the perfect restorative after a hot hike under the Mediterranean sun. The walk up the hill from the beach afterwards was torture for most. Thank god for the swim in the cool water, or I would never have made it. The van was probably the most welcome site I have ever seen! Despite our being really low on energy after after that last hike up the hill, we stopped on the way back to Sartène to visit a bee keeper. I fought to stay awake during the presentation, given in French and translated by our guides, and in between head nods, I did learn some interesting things. On the way up the hill, nostalgia for that water was high in my mind! First and foremost, Corsican bees are a special breed. Small and dark and fierce, they are a protected species. They feed on the plants of the macquis and their honey is flavored depending on the plants from which they collect pollen. Hives are strategically placed near large areas of lavender, for example, to ensure the honey has that taste. Second, bees are not easy to keep. Several of our group members have hives they maintain and they commented that it is quite labor intensive and expensive. The bee keeper today was telling us how the weather affects the macquis and therefore the bees. Too much rain or not enough, and production is down. Another interesting tidbit I did not know, is that a queen bee is not born, she is made. A generic worker bee fed royal jelly will become a queen. As a professional bee-keeping operation, queens are therefore “manufactured” so that when one is no longer prolific, another will take her place. It is the natural course of things – just helped along by man and commercial interests. Our presentation included a look at a hive and at the honey in the comb. 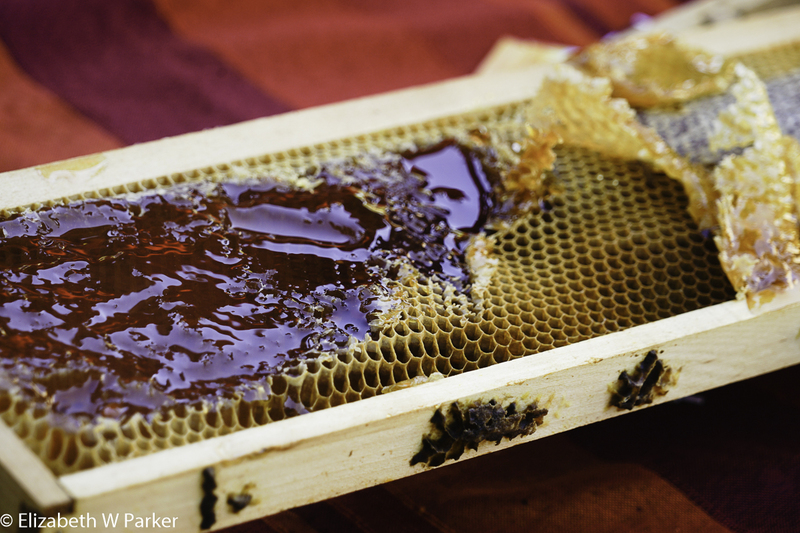 We also learned about beeswax, another product of bee-keeping. We did buy some honey to bring home, and then mercifully returned to the hotel to clean up and rest before dinner. This evening we were back in the hotel in Sarténe, and had a group dinner in restaurant nearby, Les Jardin de l’echauguette. What a magical place to eat! 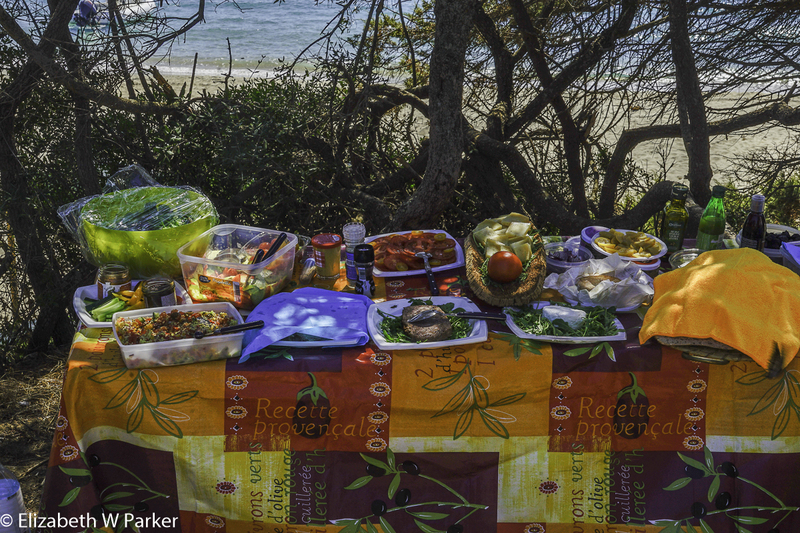 We were at a long, long table (there are 18 of us including our 3 guides). We’re under the trees with lights overhead in the leaves. 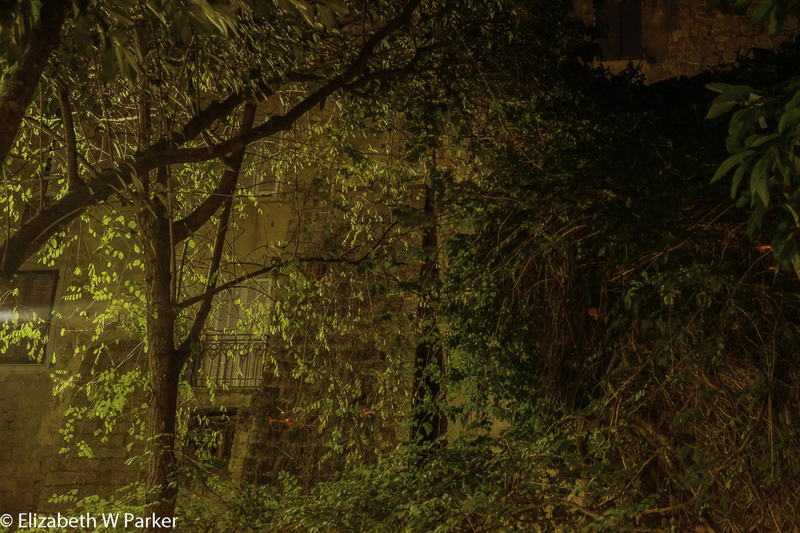 Tucked behind a stone building,, under the protection of the city walls, other buildings rise around us like a cocoon. 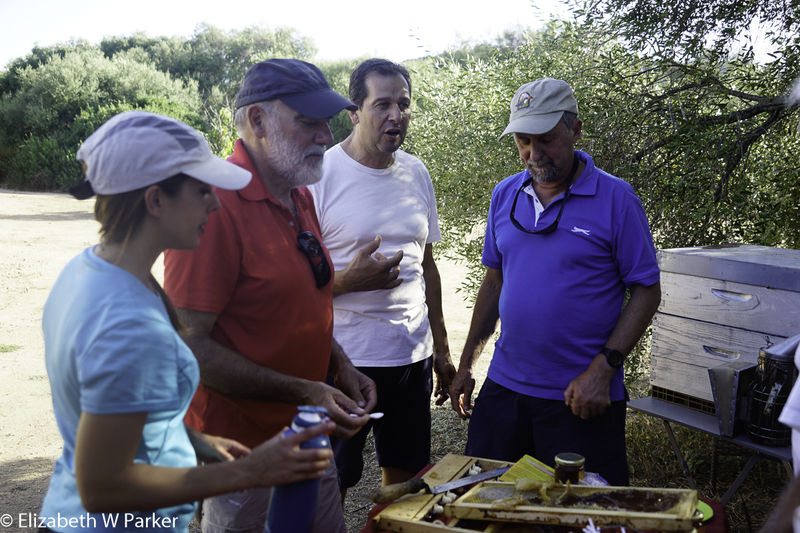 The food is abundant, the conversation lively. Life is supposed to be lived like this! The magic light of our dinner in the garden. Tomorrow we move to Bonifacio. 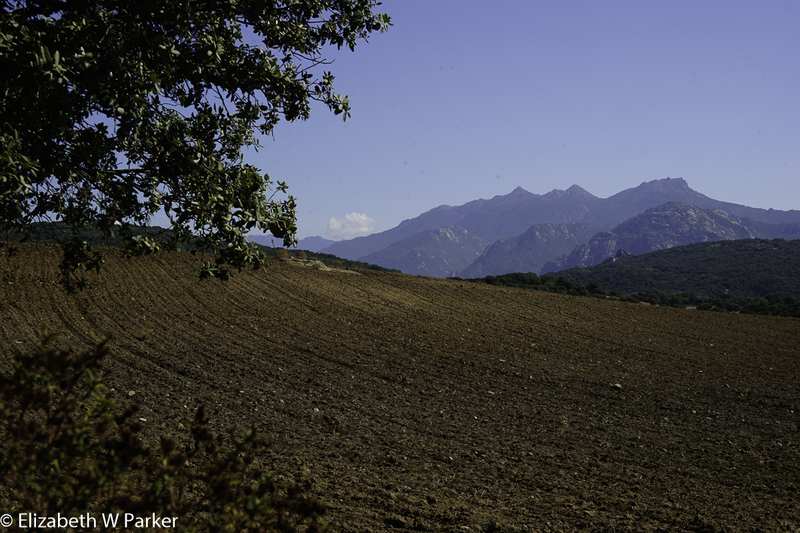 Keep reading here about our adventures in the extreme south of Corsica.